Thanksgiving Holiday is a time for family and cheer. Well, a time for family. It's the holiday where we ask our doctor relatives to look at that weird skin growth, and for our geek relatives to fix our computers. This tale is of such computer support, and how the "smart" engineers at Twitter have ruined this for life. My mom is smart, but not a good computer user. I get my enthusiasm for science and math from my mother, and she has no problem understanding the science of computers. She keeps up when I explain Bitcoin. But she has difficulty using computers. 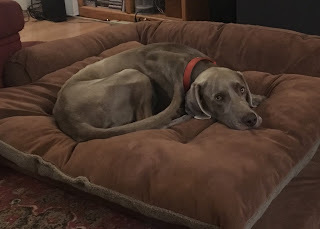 She has this emotional, irrational belief that computers are out to get her. This makes helping her difficult. Every problem is described in terms of what the computer did to her, not what she did to her computer. It's the computer that needs to be fixed, instead of the user. When I showed her the "haveibeenpwned.com" website (part of my tips for securing computers), it showed her Tumblr password had been hacked. She swore she never created a Tumblr account -- that somebody or something must have done it for her. Except, I was there five years ago and watched her create it. Another example is how GMail is deleting her emails for no reason, corrupting them, and changing the spelling of her words. She emails the way an impatient teenager texts -- all of us in the family know the misspellings are not GMail's fault. But I can't help her with this because she keeps her GMail inbox clean, deleting all her messages, leaving no evidence behind. She has only a vague description of the problem that I can't make sense of. This last March, I tried something to resolve this. I configured her GMail to send a copy of all incoming messages to a new, duplicate account on my own email server. With evidence in hand, I would then be able solve what's going on with her GMail. I'd be able to show her which steps she took, which buttons she clicked on, and what caused the weirdness she's seeing. Today, while the family was in a state of turkey-induced torpor, my mom brought up a problem with Twitter. She doesn't use Twitter, she doesn't have an account, but they keep sending tweets to her phone, about topics like Denzel Washington. And she said something about "peaches" I didn't understand. This is how the problem descriptions always start, chaotic, with mutually exclusive possibilities. If you don't use Twitter, you don't have the Twitter app installed, so how are you getting Tweets? 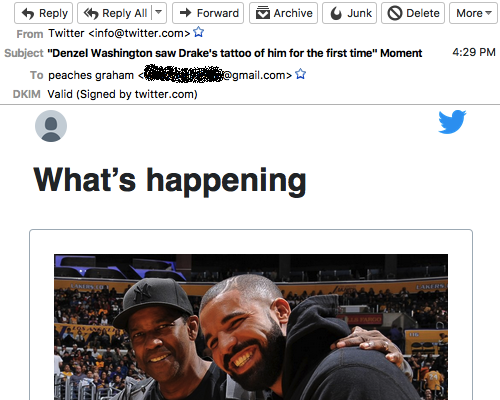 Over much gnashing of teeth, it comes out that she's getting emails from Twitter, not tweets, about Denzel Washington -- to someone named "Peaches Graham". Naturally, she can only describe these emails, because she's already deleted them. "Ah ha! ", I think. I've got the evidence! I'll just log onto my duplicate email server, and grab the copies to prove to her it was something she did. 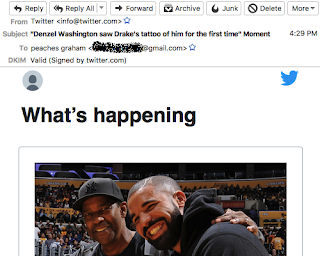 I find she is indeed receiving such emails, called "Moments", about topics trending on Twitter. They are signed with "DKIM", proving they are legitimate rather than from a hacker or spammer. The only way that can happen is if my mother signed up for Twitter, despite her protestations that she didn't. I look further back and find that there were also confirmation messages involved. Back in August, she got a typical Twitter account signup message. 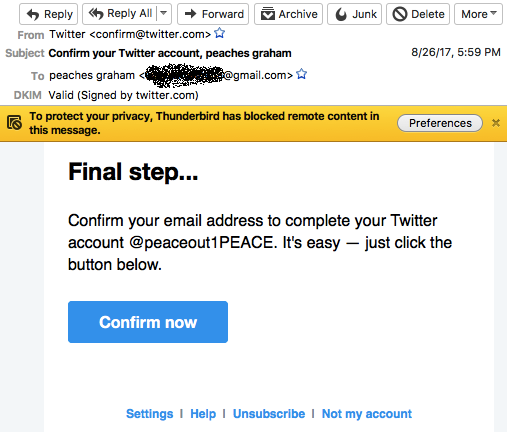 I am now seeing a little bit more of the story unfold with this "Peaches Graham" name on the account. 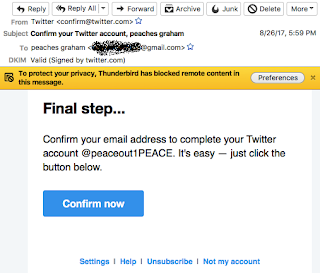 It wasn't my mother who initially signed up for Twitter, but Peaches, who misspelled the email address. It's one of the reasons why the confirmation process exists, to make sure you spelled your email address correctly. It's now obvious my mom accidentally clicked on the [Confirm] button. I don't have any proof she did, but it's the only reasonable explanation. Otherwise, she wouldn't have gotten the "Moments" messages. My mom disputed this, emphatically insisting she never clicked on the emails. "This sort of thing just doesn't happen. Twitter has very smart engineers. What's the chance they made the mistake here, or...". "...or that the user made the error?" This was wrong to say even if I were right. I have no excuse. I mean, maybe I could argue that it's really her fault, for not raising me right, but no, this is only on me. Regardless of what caused the Twitter emails, the problem needs to be fixed. The solution is to take control of the Twitter account by using the password reset feature. I went to the Twitter login page, clicked on "Lost Password", got the password reset message, and reset the password. I then reconfigured the account to never send anything to my mom again. But when I logged in I got an error saying the account had not yet been confirmed. I paused. 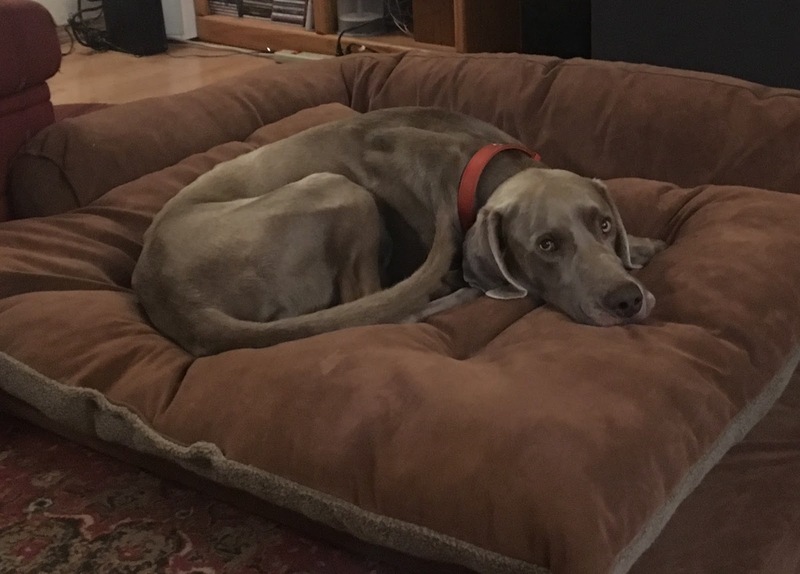 The family dog eyed me in wise silence. My mom hadn't clicked on the [Confirm] button -- the proof was right there. Moreover, it hadn't been confirmed for a long time, since the account was created in 2011. I interrogated my mother some more. It appears that this has been going on for years. She's just been deleting the emails without opening them, both the "Confirmations" and the "Moments". She made it clear she does it this way because her son (that would be me) instructs her to never open emails she knows are bad. That's how she could be so certain she never clicked on the [Confirm] button -- she never even opens the emails to see the contents. My mom is a prolific email user. In the last eight months, I've received over 10,000 emails in the duplicate mailbox on my server. That's a lot. She's technically retired, but she volunteers for several charities, goes to community college classes, and is joining an anti-Trump protest group. She has a daily routine for triaging and processing all the emails that flow through her inbox. So here's the thing, and there's no getting around it: my mom was right, on all particulars. She had done nothing, the computer had done it to her. It's Twitter who is at fault, having continued to resend that confirmation email every couple months for six years. When Twitter added their controversial "Moments" feature a couple years back, somehow they turned on Notifications for accounts that technically didn't fully exist yet. Being right this time means she might be right the next time the computer does something to her without her touching anything. My attempts at making computers seem rational has failed. That they are driven by untrustworthy spirits is now a reasonable alternative. Those "smart" engineers at Twitter screwed me. Continuing to send confirmation emails for six years is stupid. Sending Notifications to unconfirmed accounts is stupid. Yes, I know at the bottom of the message it gives a "Not my account" selection that she could have clicked on, but it's small and easily missed. In any case, my mom never saw that option, because she's been deleting the messages without opening them -- for six years. Twitter can fix their problem, but it's not going to help mine. Forever more, I'll be unable to convince my mom that the majority of her problems are because of user error, and not because the computer people are out to get her.